Wires are used for control, support, anchorage, lengthening of stems and binding materials together. 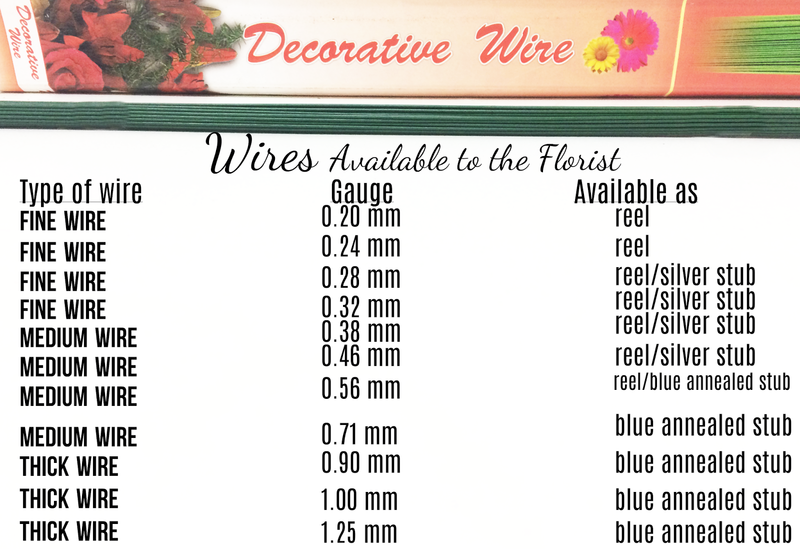 Wiring is thus a very necessary technique for the florist, but it is important to remember to use a little wire as possible, as nowadays less wire is used than previously and more natural stems are seen. The glue gun has also replaced wire in many areas of the florist's work. Most of these are available with a green plastic coating. Decorative real wires are now available in a range of colors including metallic copper and gold. 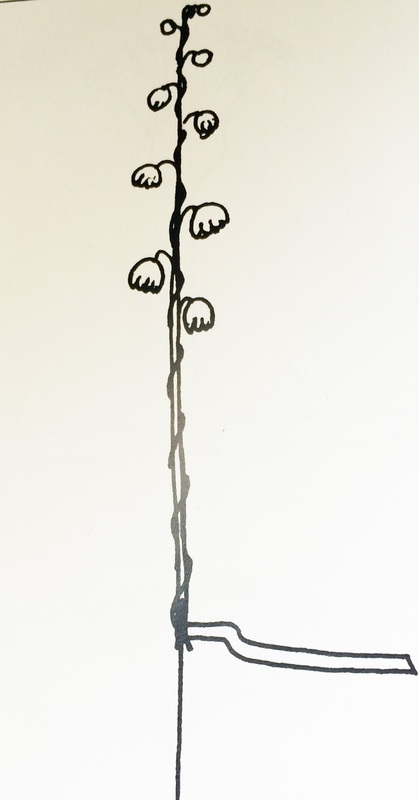 These are wired as a decorative feature to wrap around a flower head such as a tulip or a rose, to twist around stems or branches, to bind stems into bundles or to create a caged effect. These techniques are more suited to contemporary design. There is no single correct way for wiring material, especially support wire, as long as it does the job effectively, but it should be used. 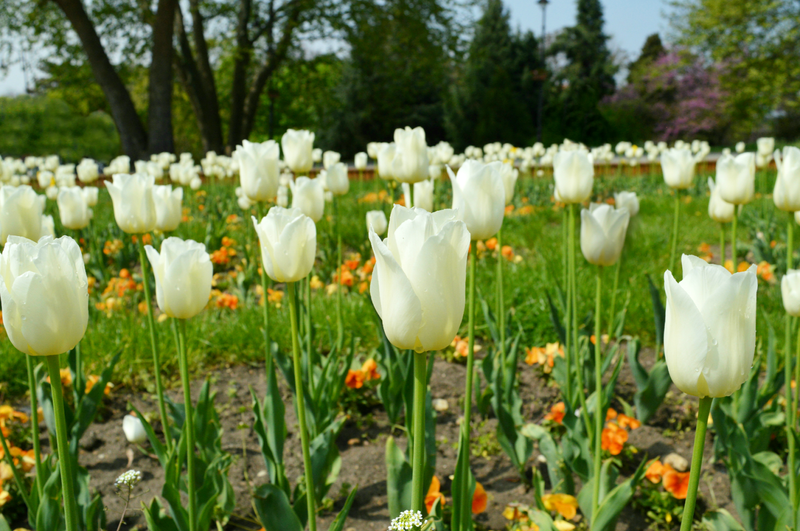 Some flowers, if conditioned well, need little if any wiring, whereas others are less sturdy and need more support. Wired material should not make the design stiff and heavy. All visible wires should be covered with tape. Green-coated wire does not need to be taped except where it is used as a mount and then only over the stem end. It is important when wiring to cover the stems with tape as quickly as possible in order to slow up the dehydration process. Support wiring strengthens a stem and is used mostly for wired bouquets, corsages and any other work where material requires extra support. In tied wedding work it is sometimes necessary to support wire a few of the longer trails. The wire should be unobtrusive and covered with tape where visible. When the work is completed the wires going through the tying point should be cut out and the ends pushed back into the tying point. 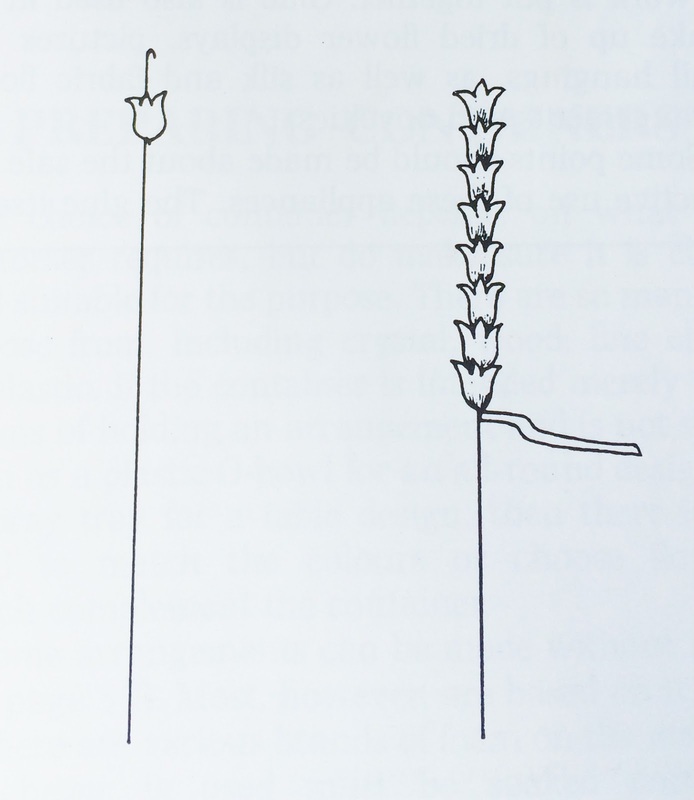 Although most funeral flowers in foam are not wired, the lateral and focal flowers may need support. Roses and carnations are very brittle and are thus vulnerable when handled, so it is a good idea to support wire some of the taller flowers, which can easily be knocked and damaged. 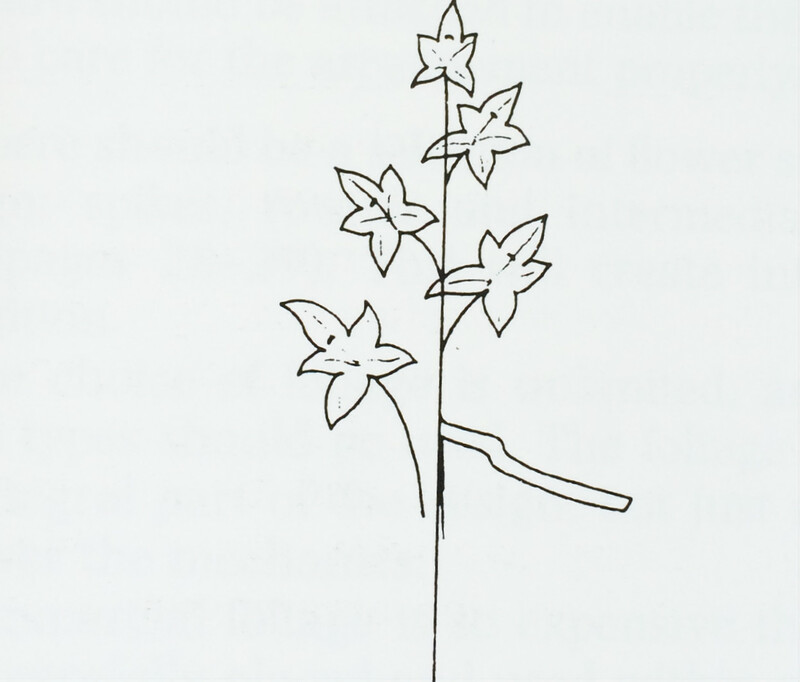 To test whether a flower is adequately supported for the purpose intended, hold the stem at the base. If it swings around, then the gauge is too fine. It is rigid with no movement, then the gauge is too heavy. There should be a degree of light, controlled movement. WHEN MOUNTING MATERIAL FOR USE IN FOAM, PARTICULARLY FOR FUNERAL WORK, BEND THE ENDS INTO A HAIRPIN BEFORE PUSHING INTO THE FOAM. THIS WILL GIVE EXTRA ANCHORAGE. 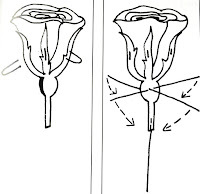 There are three methods of support wiring for flowers. Internal - This is used on hollow-stemmed flowers and some freshy stems, for example, anemones, daffodils, gerbera. 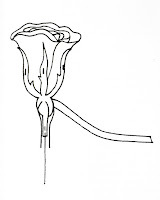 The wire is pushed up the stem on the inside until it bites onto the inside of the calyx. 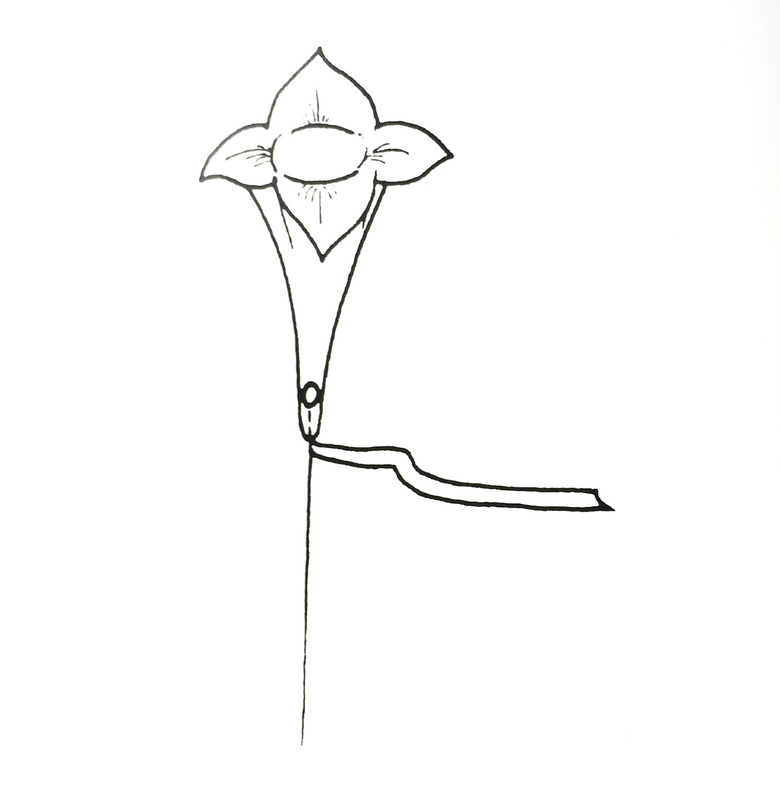 External - The wire is inserted into the calyx, carefully twisted round the base of the calyx and then brought down the stem. 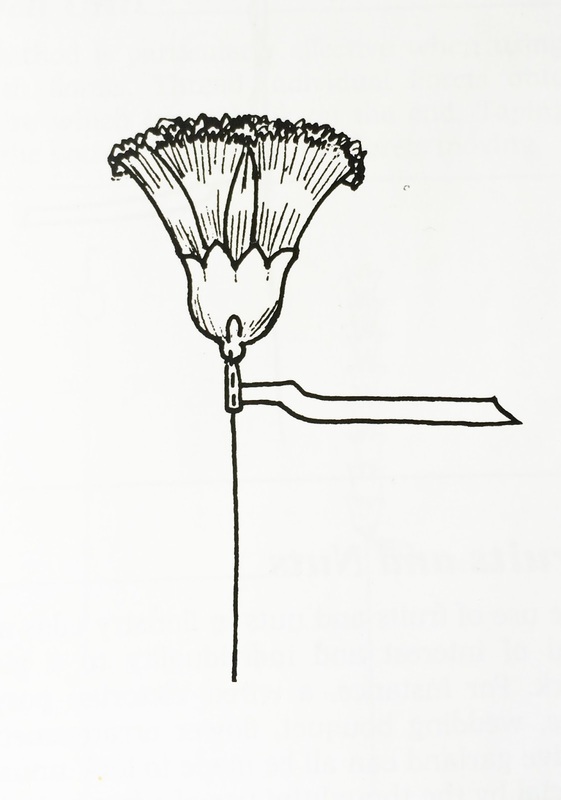 DO NOT twist to many times as this will make the flower rigid and heavy. Semi-internal - If the stem is fleshy, it is possible to support wire the top part internally and the lower half externally. This is done on such flowers as tulips, irises and gerbera when longer length is required. 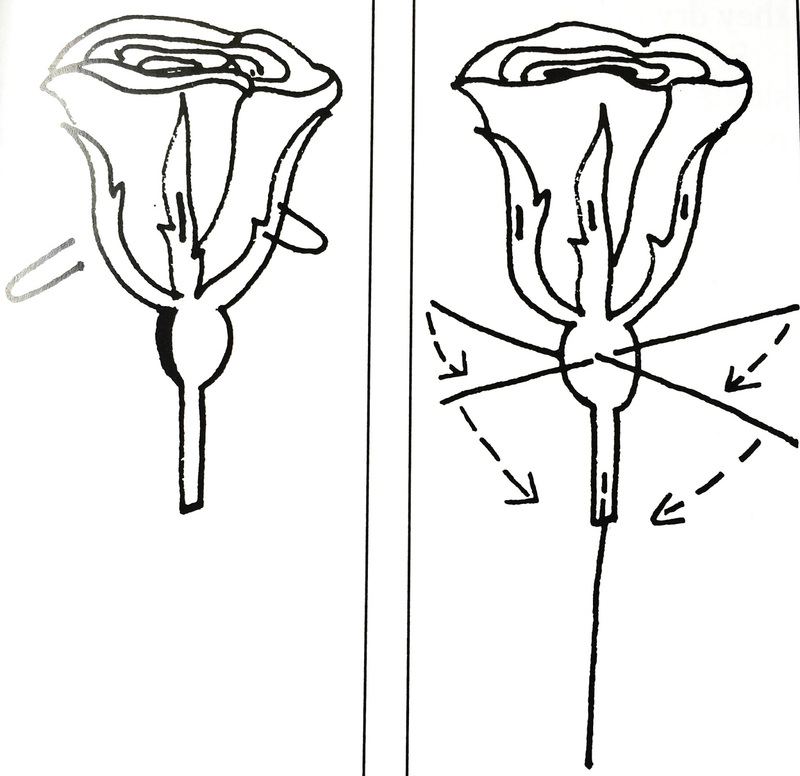 The wire should be inserted into the stem 10-12 cm below the calyx internally. 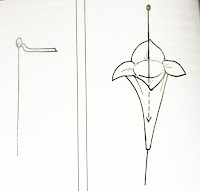 The wire below the insertion point should be twisted down the outside of the stem. 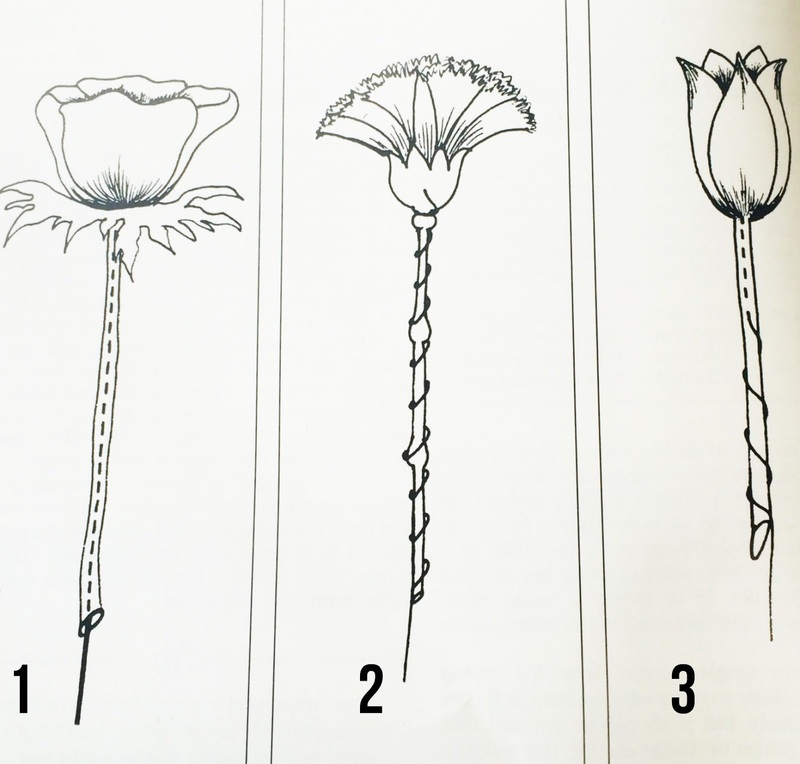 Some flowers can be internally wired for a short length and then, when a longer length is required, both internal and external methods can be used. 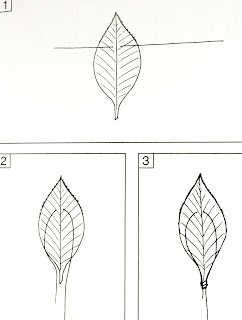 Individual leaves can be support by a method called stitching, which is shown below. 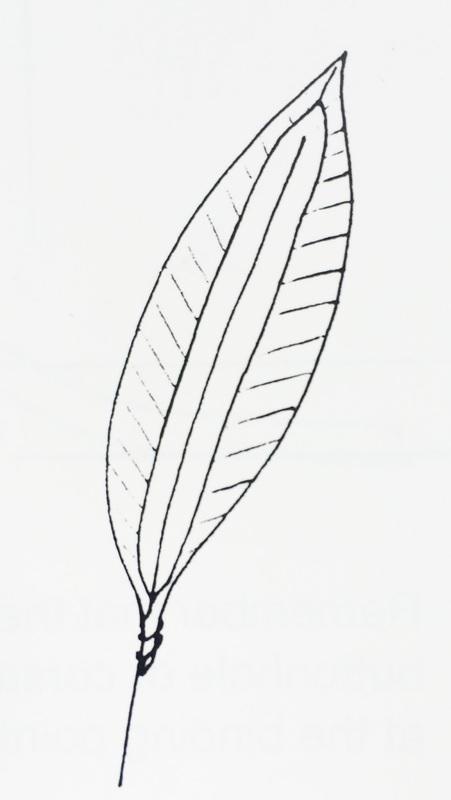 Hold the leaf with the underside uppermost. 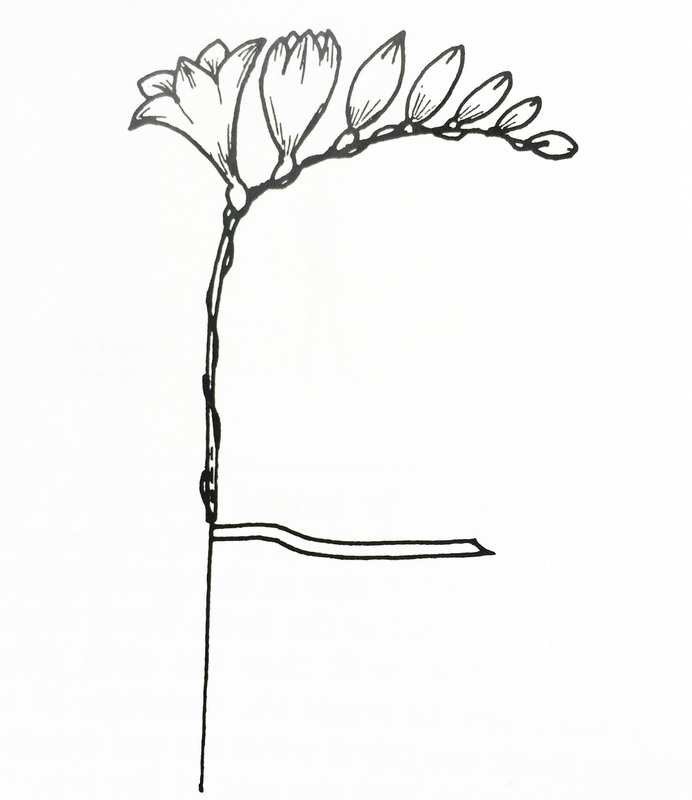 Using a good length of fine wire (size depends on the leaf thickness), take a small stitch through the fronth of the leaf over the main vein about a third down from the tip. 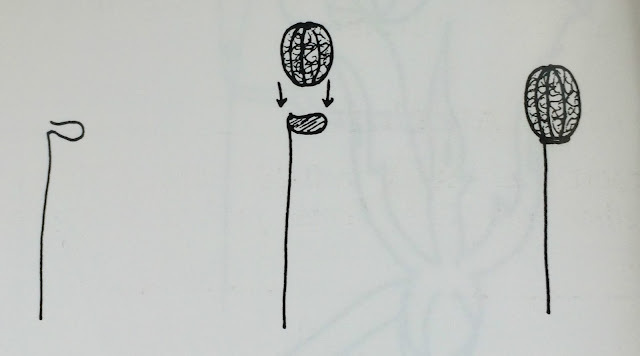 Form a loop with the wire ends and twist them together at the base of the leaf to form a stem. If green wire is available, it should be used; Otherwise this is the one occasion when bare wire is seen, as taped wire will not go into the flesh of a stem or leaf. Some leaves are too fleshy to support wire in the normal way, and very quickly bruising appears. It is possible to tape wire onto the back of the leaf with sellotape or pot tape. This should be done as unobstrusively as possible. This is the method used for anchoring the plant material into the foam or moss or for creating a false stem for wired wedding work. The weight of the material being mounted will determine whether a single or double leg mount is necessary. The single leg mount will anchor a lighter stem, the double leg mount a heavier one. The mount is always a higher gauge than the support wire used, i.e a rose with 0.71 mm support wire will require a 0.90 mm mount. 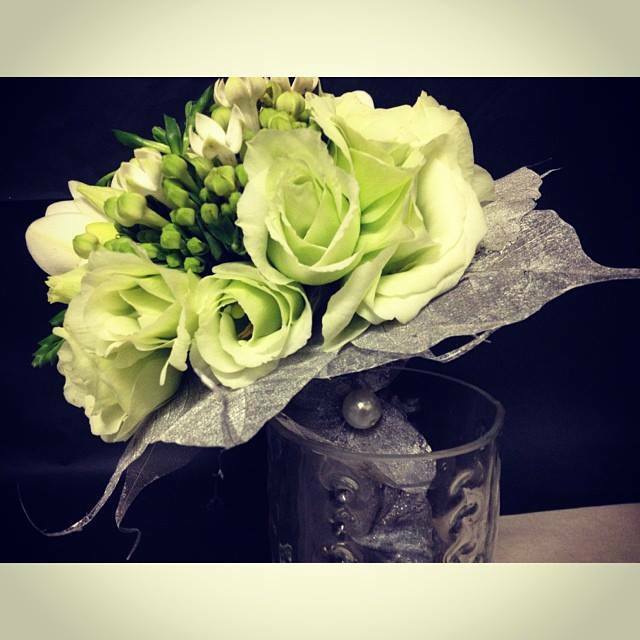 If the mount is for funeral work or a flower arrangement, then the base of the stem does not need to be covered in tape as the stem will be able to take moisture out of the foam, but if it is to be used for wedding work then the stem must be sealed with tape to retain the moisture. In wired wedding work the taped wires are put together at the binding point and the rest of the wire forms the handle, which is part of the design. 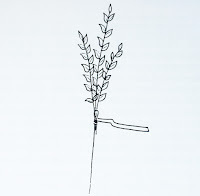 This is used for attaching moss to a frame or for binding together the wire stems of a bouquet or corasage. For wedding work 0.28, 0.32 or 0.46 mm binding wire should be used, usually from a reel. Natural stems should never be bound with wire. All the stems should end and become false stems at the binding point. 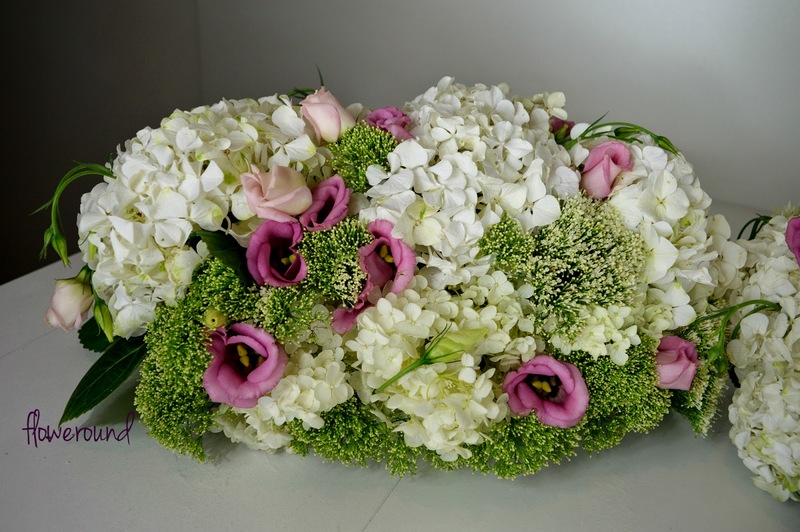 Sometimes when a bouquet has been made from only a small amount of material it is necessary to add wire to the handle to give more weight to balance the bouquet, but care should be taken that it does not feel too heavy. 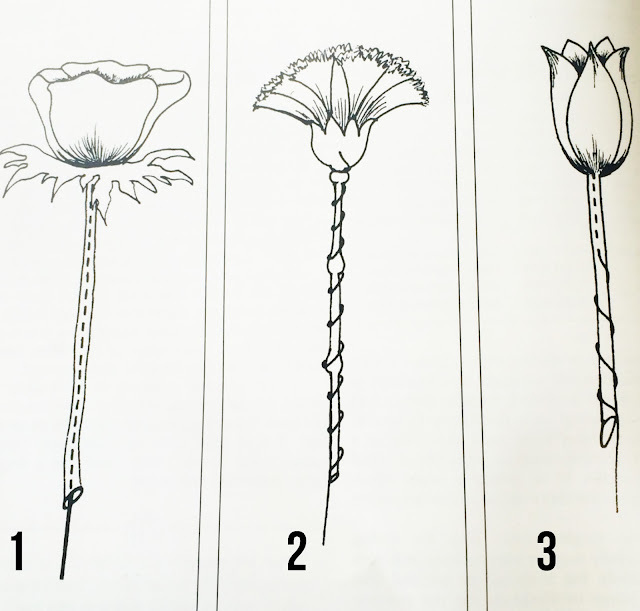 The size, shape, structure and use of the flower determine wiring technique. As long as the method works and the gauge is correct for the purpose and all the visible wires are concealed, it does not matter how it has been achieved. 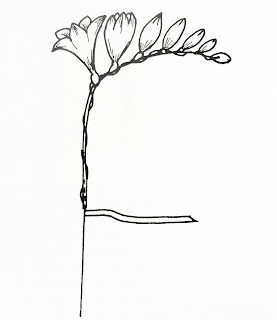 Freesias are wired in various ways, the following being one example. Using 0.28 mm green reel wire, wind carefully down the stem from the top bud to the largest bud. To form a false leg, push a 0.56 mm or 0.71 mm wire into the base and tape firmly. Tape the tip of a 0.28 mm wire to form a little ball. 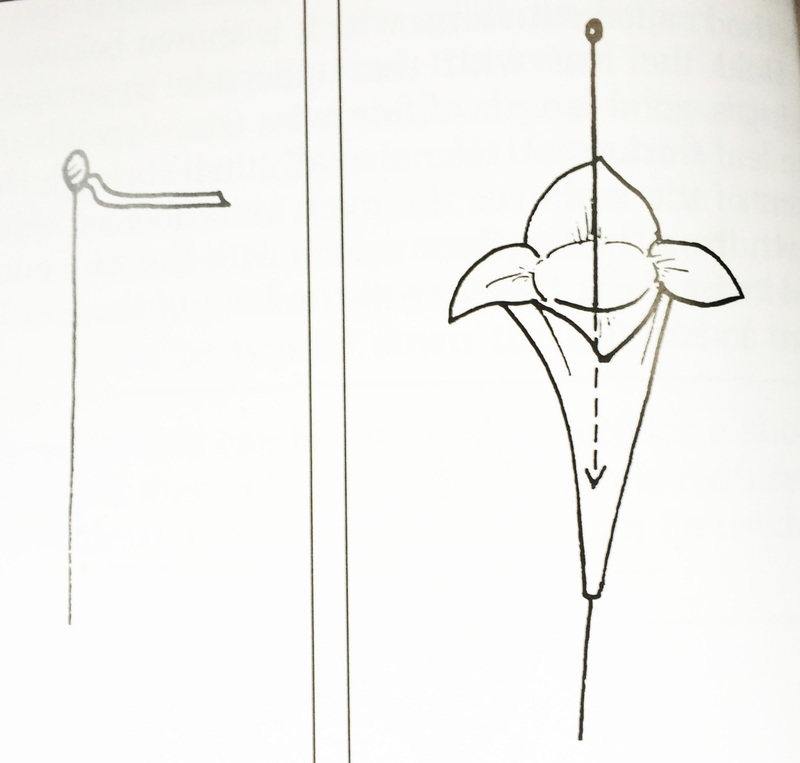 Push the untaped end through the top of the flower and pull gently down to form a false stem. Then carefully tape from the base of the flower to end of the wire. REMEMBER THAT THE LAST THING TO DO WITH A BUTTONHOLE OR CORSAGE IS TO ADD A STEEL PIN AT THE BINDING POINT FOR THE CUSTOMER'S USE. Pin sepals using small "hairpins" of green 0.28 mm wire. Insert two 0.32 mm silver wires to form a cross through the seedbox. Carefully bring down the wires as shown in the figure and tape from the top of the seedbox to conceal all wires. 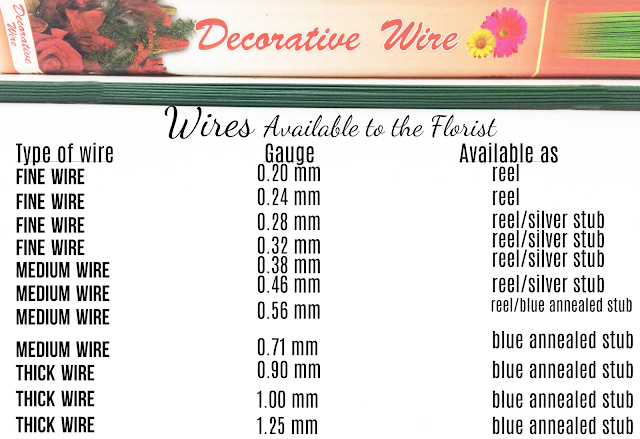 Use 0.46 mm or 0.56 mm for cross wires, on larger roses, and 0.71 mm or 0.90 mm for the stem wire. Push 0.71 mm wire up throuh the calyx and out of top of flower. Make a hook at the top and pull wire down until the hook reaches the base of the calyx. Tape the stem and the wire. Use 0.20 mm green reel wire. 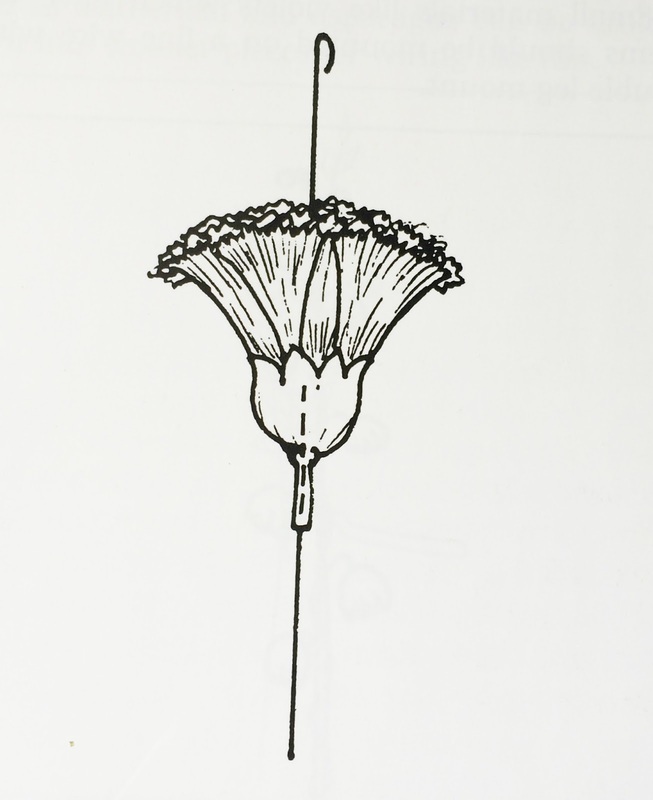 Start at the base of the stem and wind the wire round in between the florets, finishing at the top around the base of the last floret. Cut the wire as close to the floret as possible. 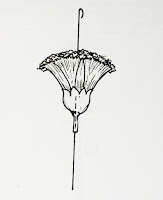 Small materials like violets which have weak stems should be mounted on a fine wire with a double leg mount. The use of fruits and nuts in floristry adds a great deal of interest and individuality to a piece of work. 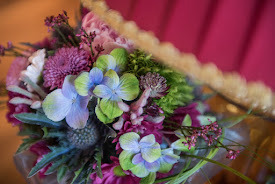 For instance, a wired Victorian posy, corsage, wedding bouquet, flower arrangement and festive garlands can all be made to look unusual or special by the thoughtful use of a few nuts, berries or fruits within the design. These material must be support wired to provide a sufficiently long stem to insert in the design and to ensure that the material remains secure during its use. Fruit and berries should rarely be left on their natural stems, especially for fine delicate work. Not only are the stems too thick or woody to include in the construction but also most fruits and berries have a tendency to fall off their branches when they dry out in a warm atmosphere. 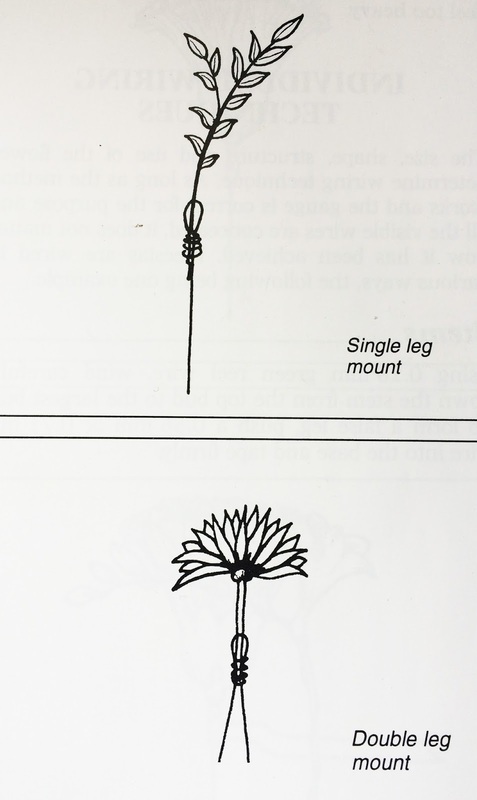 For most small berries a fine stub wire used as a single leg mount is all that is required. The wire is passed through the base of the berry. Fruits that do not bleed when pierced, such as cotoneaster or small crab apples, can be wired this way. Most nuts do not have stems and are far too hard to pierce with a wire. A solution to this is to bend one end of a suitable gauge of stub wire into a small ring or loop. Carefully place a generous amount of hot glue onto this and then press the nut into the molten glue until it sets. This provides a secure fixing and also adds a stem. Larger, heavier fruits such as apples, oranges and lemons need to be supported on a much heavier wire such as 0.71 mm or more often 0.90 mm. 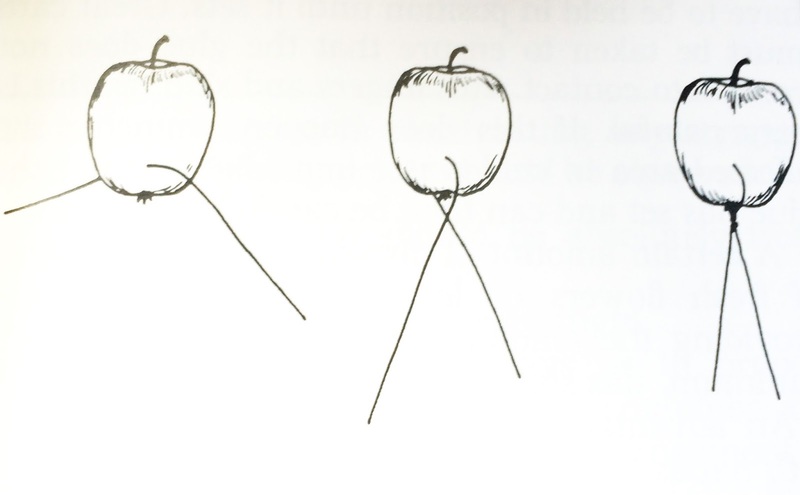 The wire is pushed through the lower half of the fruit so that an equal amount protrudes from each side of the fruit. Both wires are then bent down over the fruit and then twisted together underneath into foam for arrangements or into garlands. If several fruits are being used in a display, a more natural effect can be achieved if some are wired from the base and some from the top so that, when clustered together, the stalks and tops as well as the undersides of some fruits are visible. Fruit wired in this way for use in a table center arrangement is for visual effect only and not intended for eating. These are materials of one type which have been individually wired and then put together to form a wired unit. The size is graded from small at the top to larger at the bottom to give the impression that the unit is natural and is growing. 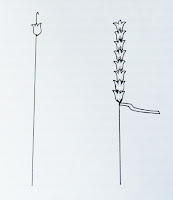 This is often referred to as pipping and is a method commonly used for headdress work where individual florets are required. _________________________________________________________________ Branching Unit Support wire leaves on 0.28 mm wire. 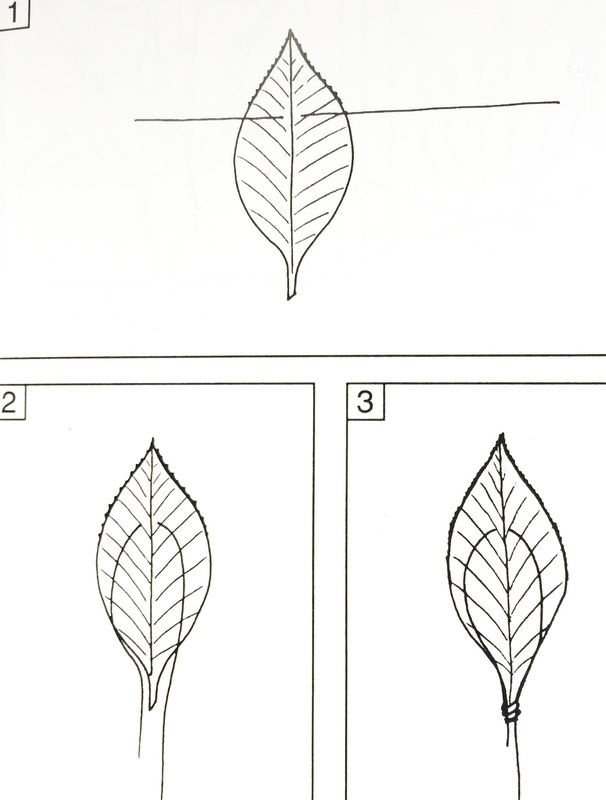 Then tape together individual leaves to form a branching unit. Put a group of stems together on a single or double leg mount, depending on the weight of the material used. 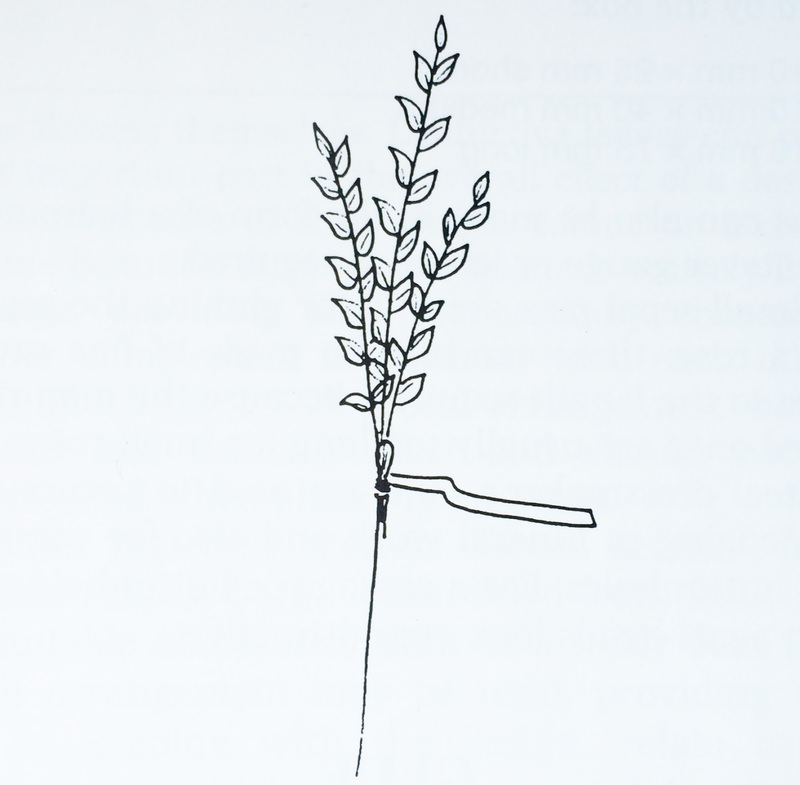 Waxflowers, little bunches of gypsophila and foliage which has been left on natural stems can all be wired in this way. A lot of foliage such as leatherleaf and asparagus can be broken down into smaller pieces for wiring like this. ______________________________________________________________________Ribbed Unit This method is particularly effective when using hyacinth florets. 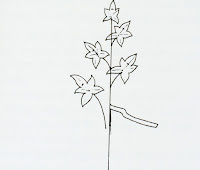 Thread individuals florets onto stay wire which has a hook on the end. Taping below the bottom floret stops the florets moving. This is another method of securing material and is used particularly in funeral work for single-leaf foliage bases (e.g laurel and ivy). Different kinds of mosses are pinned, and some flowers bases such as violets or hydrangea heads grouped into a small bunch and then pinned. Pins can also be made in the form of a hairpin in whatever gauge or length is required. 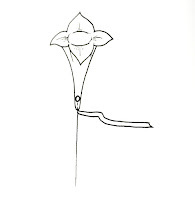 Small sepal pins are sold for pinning the sepals on a rose; these can be also be made of fine green wire to the length required, because the manufactured ones are usually too long for small roses. Steel dressmaker's pins are used to secure ribbon edging in funeral work and also for corsages and buttonholes. 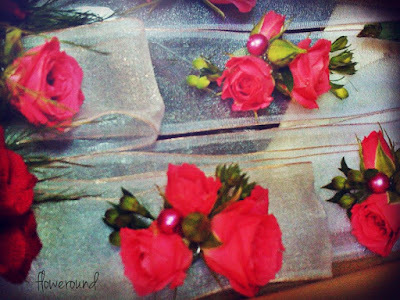 For a corsage or buttonhole, pins with pearl heads look very attractive. The usage of glue is now widely accepted as a quick and efficent alternative to many wiring and construction techniques. Fresh flowers and leaves can be glued directly onto headdress bands, combs and hats, as well as into foam bouquet holders for extra security. This reduces the amount of time needed for preparation and wiring before the item of work is put together. Glue is also used in the make up of dried flowers displays, pictures and wall hangings, as well as silk and fabric flower arrangements and novelties. Some points should be made about the safe and effective use of these appliances. The glue itself is bought as a solid cartridge which is inserted into the gun. A heating element melts the glue and a trigger forces the cartridge through the gun and pushes the molten glue out of the nozzle. 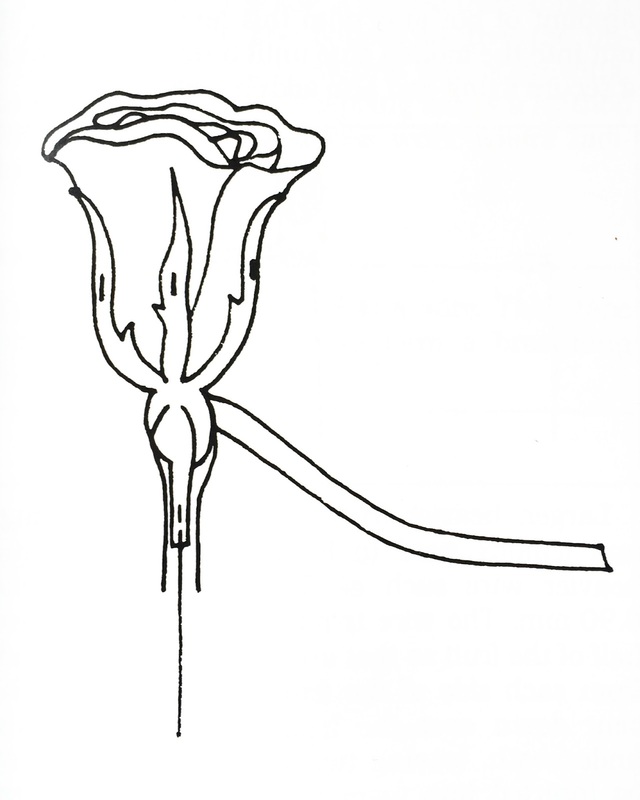 Only the smallest amount is necessary to secure a flower, and a little practice may be required to judge the right amount of pressure needed so as not to expel too much glue in one go. 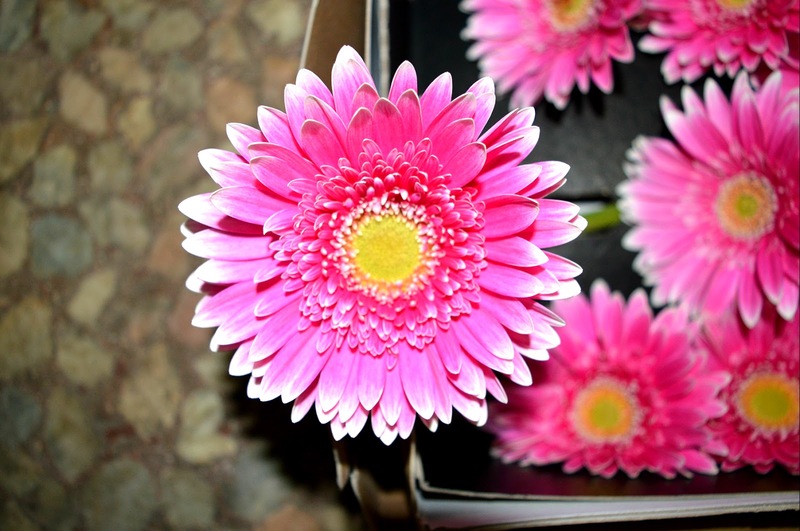 The glue takes a few seconds to dry and some heavier flowers may have to be held in position until it sets. Great care must be taken to ensure that the glue does not come into contact with fingers and skin, as this is very painful. If this does happen, immerse the affected area in cold water immediately until the glue has set and then can be carefully removed. 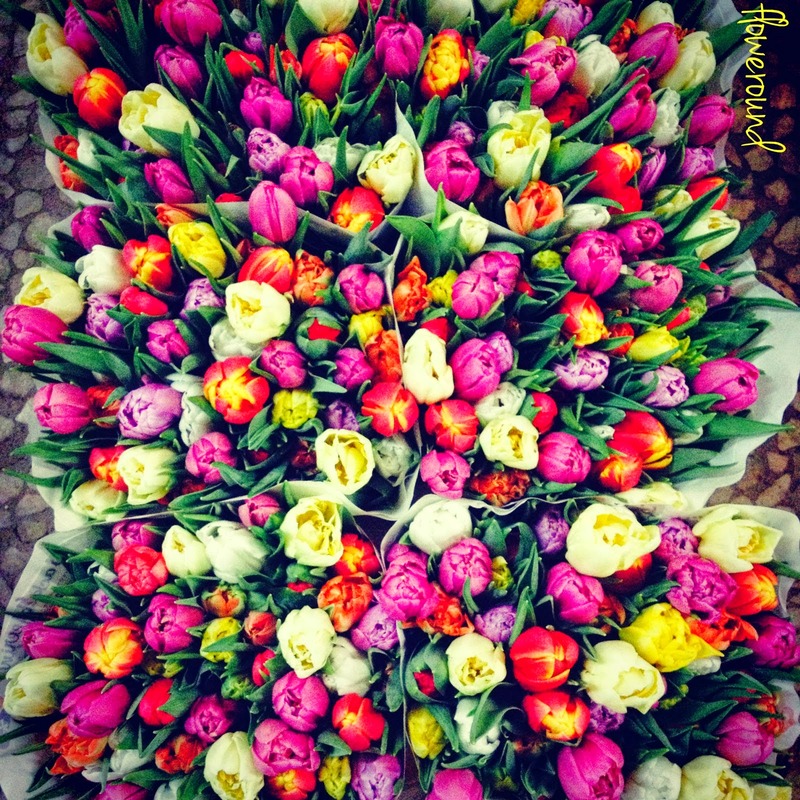 A certain amount of discoloration or scorching of fresh flowers or leaves is unavoidable but, providing the amount of glue used is kept to a minimum, this should not be visible. An advantage of the glue pot is that it leaves both hands free to hold and secure materials at the same time. It can also be used by more than one person at a time, and it melts the glue at a lower temperature than the sun. Small pellets of glue are melted in a shallow heated pan and the flowers can then be easily dipped into this and applied to whatever is being made. With this method it is also easier to control the amount of glue used. There are also other forms of cold adhesives available for use with fresh and dried material. These are usually available in a pot or in a spray form and can be used for the same purposes as hot glue. TAKE EXTREME CARE WHEN USING HOT GLUE AND ALWAYS FOLLOW THE MANUFACTURER'S INSTRUCTIONS.